Posted on May 24, 2014 by Hawaii's Local Buzz. What’s your coffee style? If you’re American, you probably drink about 3.5 cups per day and, if you’re feeling fancy, you might opt for a Cafe Breve. If you’re particular tired, you might order a double shot of espresso. On the other side of the world, Italians are requesting Antoccinos while in Hong Kong baristas serve up some good old fashioned YuanYangs. 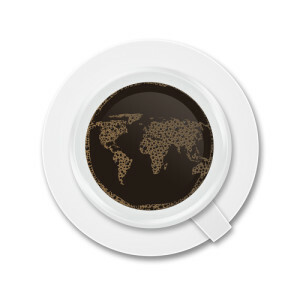 While coffee is a universal beverage, there are as many coffee styles as there are countries. We thought we’d expose you to some coffee recipes from around the world so you can drink your coffee like a world traveler. We suggest ordering Hawaiian Ka’u Coffee to experiment with your new, worldly coffee recipes. Italian Ristretto: Unlike the US, Italian coffee bars are designed for express drinking and, in fact, you drink your coffee standing up – often in a single shot. For this reason, we recommend trying a Ristretto, which is a super short shot of espresso. You can work your way up from there. German Pharisaer: After the U.S., Germany imports more coffee than any other country. To make a Pharisaer, you use one-quarter cup of black coffee, two shots of rum, one cube of sugar and a dollop of whipped cream. Because the Pharisaer contains alcohol, you may want to leave it for after-hours drinking. Or, you can substitute the rum with one additional shot of coffee and a shot of hot whipped milk. Spanish Cafe con Miel. We’ll leave you with our Number 1 choice – Cafe con Miel (coffee with honey). Coat the bottom of the glass with pure, natural honey. Then, add a shot of espresso, made with our dark roast Hawaiian Ka’u coffee, steamed milk and a sprinkling of cinnamon on top. Start your global coffee tour by ordering some of our Hawaiian Ka’u coffee and all-natural honey from Hawaii’s Local Buzz.